A dozen photographs of detainees and policemen at the Atlit detention camp. 1940s. Photos include: female illegal immigrants from the ship Haviva Reik hanging laundry on barbed-wire fences; nurses vaccinating new detainees at the camp; doctors from the Jewish Agency performing medical inspections; five photographs from the estate of a Jewish policeman posted at the camp – photographs with policemen, a photograph with illegal immigrants, planting a tree near the camp fence and more; photographic portraits of children held at the camp; and more. Four of the photographs are press photos, with ink stamps of press agencies and printed information notes on verso (in English). 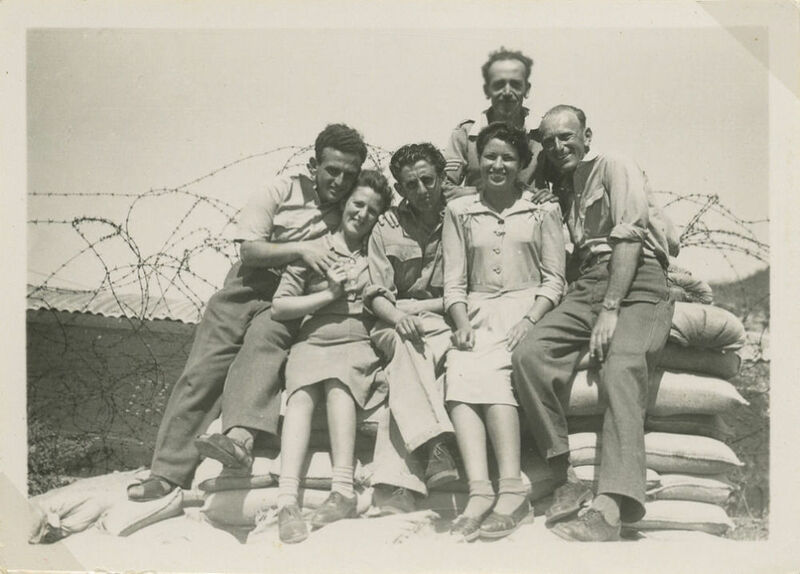 One photograph is divided on the back to be used as a postcard, with a handwritten inscription: "Souvenir, clearance camp Atlit, 14.4.1942". Size and condition vary. Good overall condition. Minor blemishes. One photograph with ink marks.